The entrepreneur in America is older than the Declaration of Independence. Consider the tanner, trapper, wainwright, cooper and stonemason. Some like John Kellogg of cereal fame had an educational benefit. Benjamin Franklin, Henry Ford and the majority of entrepreneurs, like today, went into business with an idea, some common sense and skills and rugged determination. Or foolish optimism. Or some combination of being wildly independent and skilled in stone masonry. Being an entrepreneur and running a business is challenging, frustrating, rewarding, discouraging, demanding and stimulating all at once. There are moments of exhilaration and days of despair. And there comes a time in the life of many a business, including stone masonry, when seeking additional revenue streams takes center stage for a variety of sensible reasons. If the masonry angle of the business is sound, and there’s money in the bank, thoughts turn to not only upgrading equipment, buying property and adding an employee or two, but also expanding services and growing the company. On the flip side, if business is not as strong as hoped for, then one turns to offering new services to increase the bottom line in innovative ways. Occasionally, two small business people meet, conversation flows, and each one realizes they could do more, make more and offer more by partnering their talents, products and services. One of the most natural (pun intended) expansions for masons whose work includes a significant amount of outdoor hardscaping projects is to offer landscaping services alongside exterior improvement jobs. 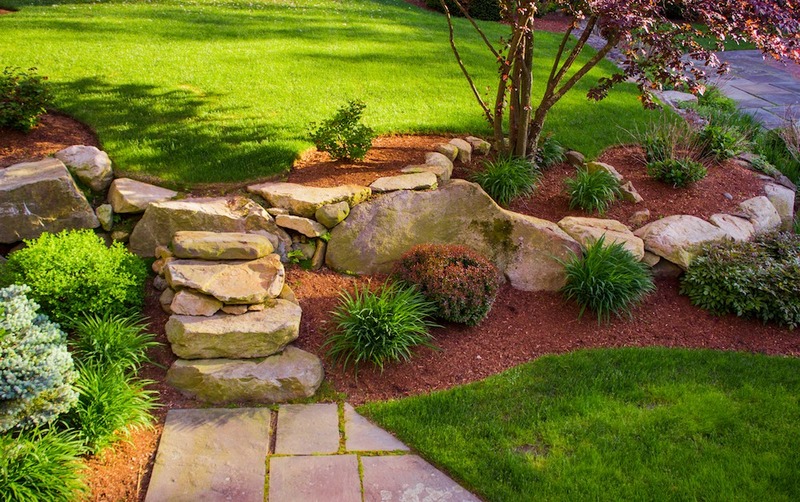 Pairing hardscaping with landscaping offers customers a one-stop kind of shop with the convenience of dealing with one contractor for all their outside property enhancements. But, while the initial idea of adding landscaping services may be appealing, there are many factors to consider if it’s a good match for the long-term. The future of landscape services looks bright as the country continues to slide toward a service economy and the Baby Boomers continue aging. This huge demographic is reluctantly tiptoeing into their 70s, and it still remains the wealthiest generation in U.S. history. Their deliberate independence means more are staying in their own homes and willing and able to pay for services that include exterior property maintenance, improvement and management. The millennials are making good money and value services so they can embrace social events, recreation, travel and personal career advancement. They are further characterized by being team players, questioning the status quo [like Baby Boomers?!] and being financially savvy. Many are first-time home buyers. The landscape design and maintenance industry is closely linked to the housing market, and as house construction continues to rise, landscaping services will follow. Residential services are abundant, but think outside the subdivision as well to places which all must make an excellent curb appeal first impression, which can make or break a new client or customer and build confidence in the brand. A first step in contemplating adding landscape services to your hardscape and masonry business is to evaluate which services you feel most competent to offer. Lawn mowing, trimming, edging and general maintenance are the most basic, while landscape design is a much more comprehensive facet. The design services, which may be much more lucrative, require knowledge, expertise and a broad grasp of soil conditions, plant characteristics, climate factors and environmental issues. Additionally, it’s a very creative endeavor balancing color, texture, size and purpose, like deciduous trees on the south side for shade in summer or cedar for a north side barrier or holly shrubs to mark a boundary between neighbors. James Ulmer, founder and owner of Back to Nature Landscaping & Construction (having added the construction after a few years in just landscaping), in Blacksburg, Va., says a big part of his job is educating the customers. “They often think our plan looks sparse around the house and outdoor living spaces, and it does for the first few years. We plan an investment for a property, and it’s a long-term growth strategy, literally. We anticipate what it will look like five and 10 years later. If homeowners want the complete look at the beginning, we’ll put in more plants, advising them to remove things once it gets crowded,” he explains. There is a tendency to forget that many bushes and trees grow as much width as height, which explains why DIY-ers often plant way to close to a house, promoting bug and mildew issues when once-little, now-big plants nestle up to siding. Though Ulmer’s business has expanded from two full-time employees to around 20 in just three years, he stops short of masonry work. “Our design team does patios, landscaping and outdoor kitchens up to the mortar. If anything requires mortar, we subcontract it to a mason. There are advantages, however, to doing both. If you do mortar already, then you have a client base which you can tap for landscape design or maintenance services.” One of his other challenges is assuring that the homeowner will water the plants. Back to Nature guarantees its plants for one year from planting with watering instructions carefully spelled out in the contract. And they do get called for a plant that died, believing it had to be a lack of water, but Ulmer focuses intensively on customer satisfaction. “It’s much less expensive to keep a client than find a new one,” he reveals. To resolve this water issue, his company will offer irrigation installation packages next spring, or customers can sign up for watering services. So, along with your decision to expand and what landscape services to offer comes the realization that you may be spending lots more of your time interacting with homeowners or property managers. Most of it may be wonderful, some of it cantankerous. The customer is not always right, but having an easy-going personality and problem-solving attitude is imperative. Amy Volkmann, manager of Nagel’s Sod and Landscaping in Medford, Minn., works with a lot of masons in her area. “There are several companies in the region which build retaining walls, then we come in with the plant material. We also do natural stone patios, but not masonry work. In fact, the big thing now is outdoor pizza ovens, and we can’t find anyone to build them.” Volkmann grew up working in the business started by her mom, Mary Helen Nagel, and her late father, Owen Nagel. Like Ulmer, she subcontracts to masons when mortar is involved. So, seeing that landscapers do not handle masonry work may bode well for a stone mason firm looking to expand into some facet of landscape services. Volkmann has a college degree in human resource management, which she admits is not very helpful in her line of work. Ulmer holds a degree in horticulture landscape contracting with a minor in business from Virginia Tech, which contributes to the relatively fast expansion of his business, but there are many ways to fold a landscape division into the masonry company. Many of the serious financial questions of potential success can be answered in crafting a simple business plan. Here is where projected start-up costs are listed for new or used tools and equipment, employee wages, best case and worst case revenue scenarios and regular expenses. One way to measure potential and gather information is simply by talking to peers, friends, neighbors and customers about the value of your potential expansion. Browse through yelp.com, angieslist.com and homeadvisor.com for positive and negative reviews of landscape companies to get a feel for what the public likes and does not like, where others excel and where some fall short. It is not practical or particularly necessary to go to college when there are so many books, websites, online classes and landscaping certification programs available. The National Association of Landscape Professionals [www.landscapeprofessionals.org] offers an array of classes which teach and test both head knowledge and practical skills. In addition, the organization offers a 10-hour OSHA course and safety certifications. Master Gardener and Master Naturalist programs are offered through many state extension cooperatives or universities. Community colleges and local garden clubs can be a wealth of information and contacts. Realtime Landscaping Plus was a pleasure to use. It was so intuitive that it felt more like a video game. much better than other programs. I could create any landscape that I wanted. Other places like Nagel Sod and Nursery have a retail shop which is sought out not only for its plants, but also for gifts and garden accents, wrought iron, memorial benches and statues. Being located a stone’s throw from Cabela’s flagship store in Owatonna, Minn., is a sweet bonus, but competition is tough. “Years ago, our nursery dealers did not sell to Wal-Mart, Lowe’s or Home Depot. Now that they do, it’s very hard to compete on the retail side of business,” Volkmann relates. Advertising your new landscape division is akin to promoting any business with social media as the new kid on the block and newspapers, regional or local magazines, television and radio still out there. And there are other ways that may not have as large a price tag over the long haul. If you possess the basic business skills of common sense, being well organized and passionate about your work, coupled with integrity and respect, then you have the opportunity to expand in many directions, landscaping among them. You might even look at becoming the general contractor for homeowners and property managers, as landscape service personnel are on the property more than sub-contractors who come and go by the job. If you are maintaining a property, you quickly become familiar with its terrain, plants, stonework and the owner or manager. You can offer suggestions and advice for enhancing the exterior for residential curb appeal or commercial image. Then you can use sub-contractors as needed, instead of being one. Embrace a long-term vision with short-term goals. Stay flexible as things unfold and maintain a solid-as-a-rock business perspective.